UChicago athletes will be able to kick off the new year with a brand new sports field on the south side of campus. The new Campus South Athletic Field, located at 61st and Woodlawn, will replace the former North Field that was removed to begin construction of Campus North. 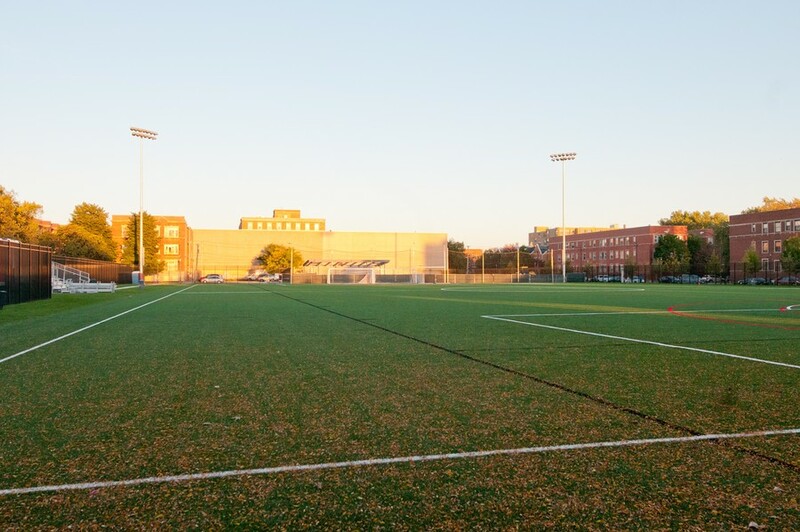 Development of the synthetic turf field, bleacher seating for up to 50 spectators, a 1,250-square-foot service building, and a smaller field for warm-ups and intramurals was completed in June. The field is designed to accommodate club and intramural sport competitions, including flag football, soccer, and Ultimate Frisbee. Likely to be busiest in the autumn and spring seasons due to varsity sports practices, it will be open from 6 a.m. to midnight on Mondays–Thursdays, 6 a.m. to 9 p.m. on Saturdays, and 8 a.m. to midnight on Sundays. However, the construction of the service building adjacent to the field has encountered delays. Because the lights of the field are powered through this service building, nighttime events are not yet possible. John Barlow, the Facilities Services Assistant Project Manager, indicated that the building, and the lights with it, will become operational sometime next month.